Overlooking the phenomenal Gulf of Kutch, Jamnagar is a beautiful destination in Gujarat that is an ocean lover’s paradise. Established as a prominent princely state around the 16th century by the Jadeja, Jamnagar is resplendent with Hindu Mythology. It is said that Lord Krishna resided here and the locals take pride in their Yadava clan lineage because of this. Boasting the first Marine sanctuary in India and the largest oil refinery in the world, this district is iconic in its past and present. A booming economy and a pleasure to tourists, Jamnagar has the best of both worlds. Here are some places you could visit in Jamnagar during your trip. As the first Marine sanctuary in the country, the Marine National Park in Jamnagar is a must see destination. There are 42 islands in the Gulf of Kutch that are part of this National Park and each one of them boasts incredible fauna and are mostly surrounded by reefs comprising of a variety of corals. Out of the many islands, the Pirotan Island is quite famous and is blessed with a diverse marine life. With adequate permissions from the Forest department, it is even possible to camp at this island. The ecosystem at this park is fragile and negligence by tourists adds to the concern of the Forest department. Mangrove forests and low tide beaches make most of these islands a delight while you explore the islands’ Marine life with wonder. With a unique ecosystem comprising of both fresh water and salt water, the Khijadiya Bird Sanctuary is a bird watcher’s paradise. A whooping 300 types of migratory birds are found here, amongst both sea and shore birds. Riddled with various types of nests, birds in this rare ecosystem have mesmerized tourists since its establishment. The black-necked stork, which is a rarity in other parts of the country, is found in plenty here. Situated close to the Marine National Park, this Bird Sanctuary is not devoid of exceptional marine landscapes either. The Khijadiya Bird Sanctuary is a destination that is hard to forget. An ideal location to glimpse a perfect sunrise and sunset, the scenery here is like a painting come alive that you cannot help but relish. Isolated and pristine, Sivrajpur Beach is an off the beaten path destination, located about 12 kms from Dwarka town on the way to Okha. Complete with white sand and blue waters, this lagoon is ideal for a relaxing day by the beach. The waters here are shallow and safe to swim in, a delight for children and adults alike. It is easy to let go of stress that comes with the hustle and bustle of a city life and walk along the length of the beach, while your feet caressed by smooth sand. Because of its isolation, there are very few facilities available here and therefore, it is advised that one carries sufficient provisions for a day at the beach. Amidst turquoise waters, this beach boasts a sunset that you will remember for a long time. Astounding in its poise, Pratap Vilas Palace is a seamless blend of imperial European architecture and royal Indian architecture. With intricate carvings of flowers, leaves, animals and many more, this palace is a tribute to an incredible fusion of art and architecture. Various parapets and columns will leave you in awe with its delicate attention to art. The 2001 earthquake has contributed to a little damage to this structure but still stands strong. Visitors aren’t allowed inside the palace but special permission can be sought from the office in Darbar Gadh for the same. Situated in the historic town of Dwarka on the banks of the Gomati River, this temple is a tribute to Lord Krishna and seeped in mythology. 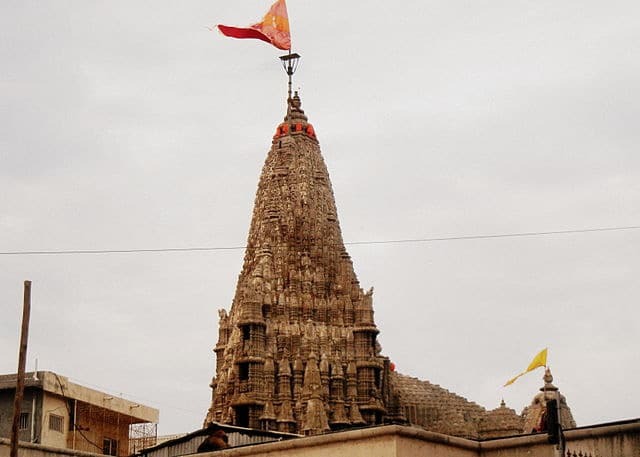 Standing tall in structure and significance, the Dwarkadhish temple is one the four most important temples to visit for Hindu Pilgrims. Regardless of religious beliefs, this temple is a superb structure build with limestone that is still in pristine condition and hosting some of the most beautiful sculptures contributed by various reigning dynasties of the region. Excavations at this site have revealed underwater structures of historic settlements and reinforce the belief of antiquity of this region. With historic buildings, mythology and wildlife that few places can rival, Jamnagar is a treasure trove for travellers. Diverse in its destinations and progressive in its economy, this district is truly a rare gem of Gujarat that must not be missed.